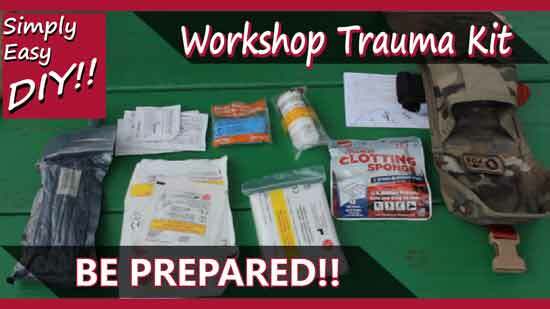 Trauma kits are meant to deal with major injuries and keep someone alive until medical care can be reached. Hopefully I'll never need one, but it’s better to be prepared and not need something than it is to need something and not be prepared. I want to be clear that this is not a first aid kit. If I need some neosporin and a band aid, I'll walk into my house and get a band aid and neosporin. When a first re-sponder responds to an injury scene there’s an order of evaluation that is followed when assessing a patient. According to my understanding it is based on how quickly an injury will kill you. Out of all the things on the list, one item accounts for 80% of injury related deaths. While in a workshop environment, it would stand to reason that this would be someones first order of business when dealing with injuries. That is where I put my thoughts and money. Everything in my trauma pack cost around $70. A small price to pay if it saves your life one of these days. This item is not listed in the video nor is it in my trauma kit but I see many good reasons to add it. Yes you can get the items out of the bag with one hand. 2. Grasp the flip top of the pack and give a quick jerk to release the velcro. 3. Then grasp one of the items in the pack and give a quick jerk or two to release that one item. 4. Then the whole medical pouch can be grasped from the bottom, flipped upside down and the other items will then fall loose. Me removing the items from the kit was not meant to be viewed as a demonstration as to how to remove items from a trauma kit in an emergency situation. The last thing one would probably be doing is calmly trying to remove all the items at the same time as I did in this video. In other words...don't do that. Plus the intent is not to be able to do everything with one hand. The intent is to eliminate having to do multiple things with two. All of the items in my kit can be opened with one hand and a mouthful of teeth. The handy dandy "bite and tear" method has been proven effective. In fact, I think that fits perfectly with my simple and easy philosophy. A comment came in from a viewer that I thought was extremely insightful and I thought it would be helpful to share that here on this post. Trauma shears (can't treat what you can't see), dressings (4x4 minimum/ABD/multi trauma), Kerlex (wrapping), tape (paper;non-latex), ice pack, tourniquet, and ice pack. I am a paramedic by day and wanna be woodworker off duty. My favorite request would be INFORMATION! Well thanks Chuck and same to you. In fact, here are some links to the items he recommends as well.